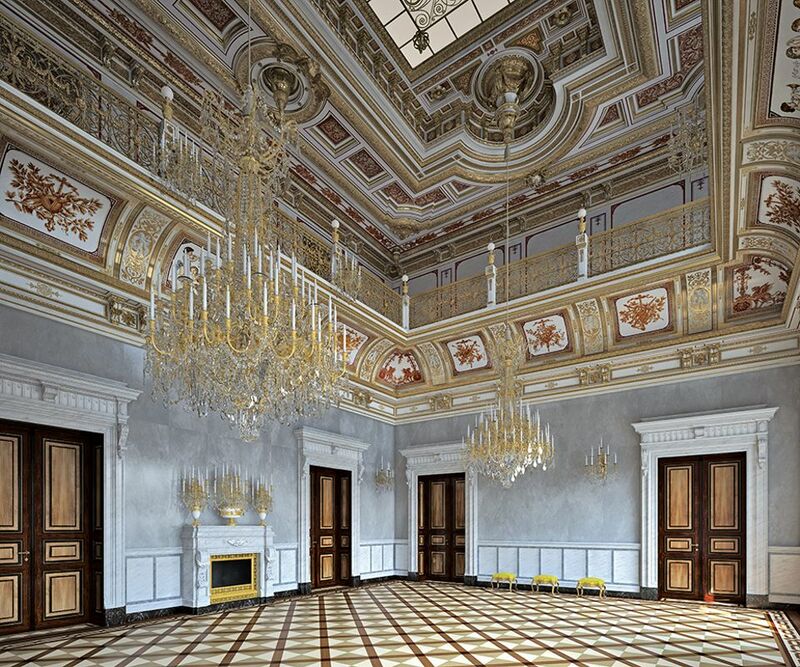 A 19th-century ballroom decorated with gold leaf, marble and stucco will open to the public tomorrow (26 January) in Dresden’s Residential Palace complex, a casualty of Allied bombing in the Second World War that is now undergoing major reconstruction. The Small Ballroom was designed by the architect Bernhard Krüger, a pupil of Gottfried Semper, the architect of Dresden’s famous opera house, and it belonged to the apartment of the Queen of Saxony, Amalie Auguste of Bavaria. Built between 1865 and 1868 in the historicist style of the Dresden opera house to imitate High Renaissance architecture, it was the most important construction project undertaken by King John of Saxony. The ballroom is located in the Georgenbau, a 16th-century Renaissance building by the main palace building that was almost completely destroyed in the air raids of 1945. The Georgenbau was rebuilt in the 1960s, with a reconstruction of the original façade but only a simple interior. For the latest reconstruction, costing €6.1m, restorers worked from historical construction documents and photographs. Local sculptors and painters recreated the ballroom’s elaborate ornamentation, including figures of flower children and putti playing musical instruments. The 10m-high room—the height of two floors—has an elegant parquet floor and walls of marble and stucco. It increasingly gains grandeur towards the ceiling, with a gilded gallery and an ornate painted and gilded ceiling hung with crystal chandeliers. “The historical significance and special features of the Small Ballroom and the good documentation of the room justified its reconstruction,” said Sandra Jäschke, a spokeswoman for the Finance Ministry in Saxony. Rebuilding Dresden’s Residential Palace has so far cost more than €300m, with highlights including the reopening of the Historic Green Vault royal treasure chamber, the coin cabinet, the armoury and a display of royal Renaissance costumes. The process is due for completion in 2021. Another milestone will be the reopening of the royal state apartments in September, to coincide with the 300th anniversary of their original debut: they were first opened by Augustus the Strong for the month-long wedding celebrations for his son, Prince-Elector Frederick Augustus. The apartments were almost completely destroyed in the war, although some of the furniture, textiles and paintings were removed and stored elsewhere before the bombing and remained intact. Among the preserved original objects to be displayed are silver furniture and gold pilasters from the audience chamber and Augustus the Strong’s costume for his coronation in 1697.